Objective The objective of this study was to assess the hemodynamics of labor, delivery, and 48 hours postpartum in women undergoing vaginal and cesarean deliveries by utilizing a whole body bioimpedance-based device. Materials and Methods A prospective longitudinal single-center observational study was performed between September 2014 and September 2015. The hemodynamics of low-risk women undergoing spontaneous vaginal delivery were compared with those undergoing elective cesarean sections. Cardiac index (CI), stroke index, total peripheral resistance index (TPRI), and mean arterial pressure (MAP) were assessed at different time points during delivery and in the immediate postpartum period (1, 24, and 48 hours postpartum). Results Eighty-seven women were evaluated, 63 parturients in the vaginal delivery group and 24 in the cesarean delivery group. Normal vaginal delivery was characterized by a reduction in MAP and CI after epidural anesthesia, whereas elective cesarean sections were characterized by a rise in MAP and CI after spinal anesthesia. As labor progressed, CI increased reaching its peak during the second stage. Immediately following delivery, TPRI declined to its nadir with no significant change in CI. As opposed to vaginal delivery, in cesarean delivery, TPRI peaked within 1-hour postpartum resulting in a significant decline in CI. 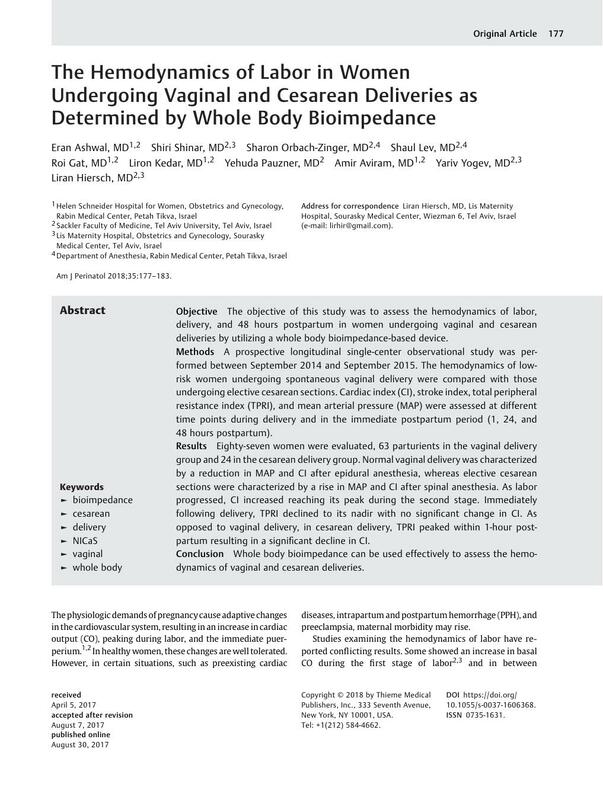 Conclusion Whole body bioimpedance can be used effectively to assess the hemodynamics of vaginal and cesarean deliveries.